Peter Parks/AFP/Getty ImagesBillionaire entrepreneur and founder of Tesla and SpaceX Elon Musk. He’s the latest tech entrepreneur to discuss Facebook after the Cambridge Analytica scandal that has cut tens of billions of dollars off Facebook’s market value. The Tesla and SpaceX Facebook pages have vanished, minutes after Elon Musk – the CEO of both companies – said that he had never seen the SpaceX Facebook profile and planned to delete it. It started when Musk replied to a tweet earlier in the week from WhatsApp cofounder Brian Acton, when he tweeted “It is time. #deletefacebook.” Facebook bought WhatsApp for $US19 billion in 2014, making Acton a billionaire. “Delete SpaceX page on Facebook if you’re the man?” a fan chimed in. “I didn’t realise there was one. Will do,” Musk replied. 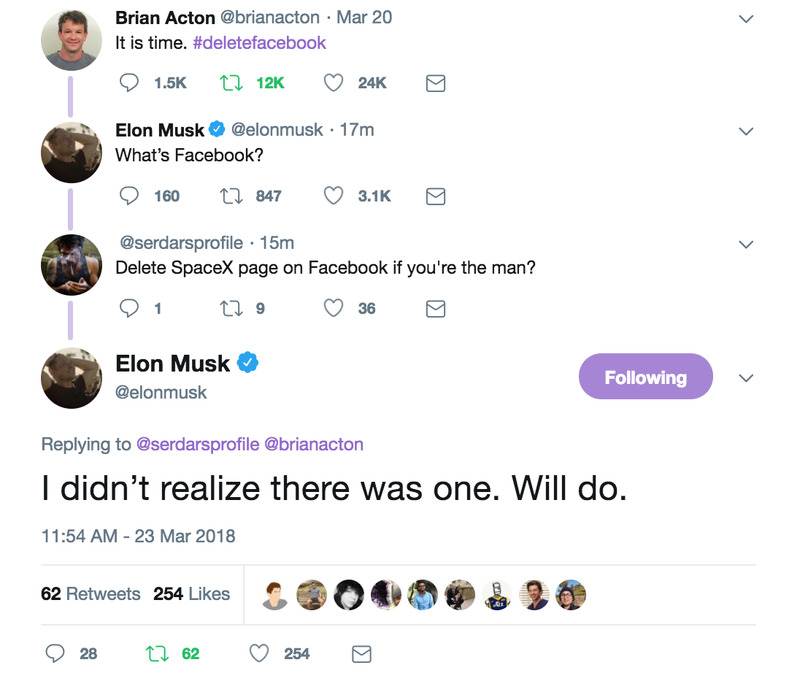 In subsequent tweets, Musk reiterated that the SpaceX page “will be gone soon” and that he “literally never seen it even once.” He also said that Facebook’s influence had started to affect Instagram, the social network’s photo-sharing app. Musk’s negative feelings toward Facebook may be related to a 2016 dispute where Zuckerberg blamed SpaceX for a failed launch that destroyed a Facebook satellite. “Yeah, my fault for being an idiot. We did give them a free launch to make up for it and I think they had some insurance,”Musk said in a tweet to Mashable’s Kerry Flynn. Musk is the latest notable tech entrepreneur to wade into the recent Cambridge Analytica scandal, which centres on the British data company Cambridge Analytica, which has ties to Donald Trump’s 2016 presidential campaign. It improperly obtained information from as many as 50 million Facebook profiles. 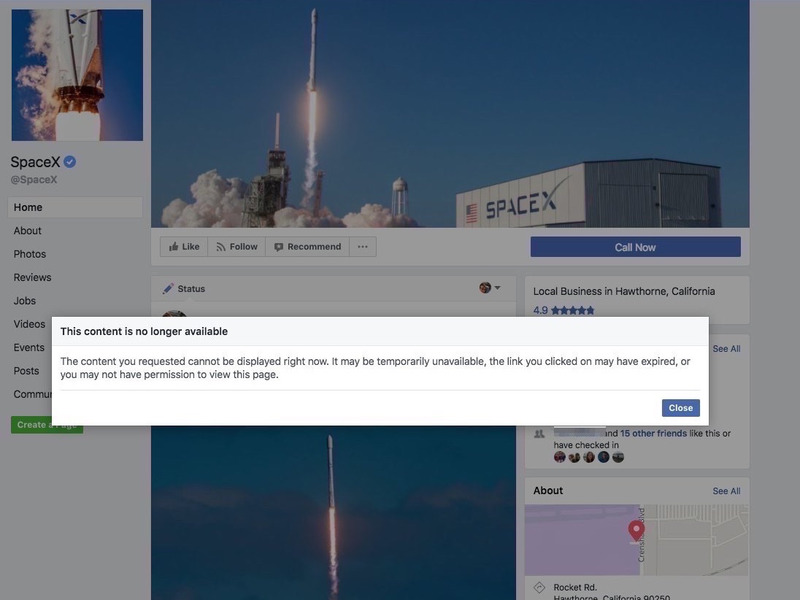 SpaceX’s Facebook page had 2.6 million likes before it was deleted. SpaceX still has a profile on Facebook-owned Instagram.